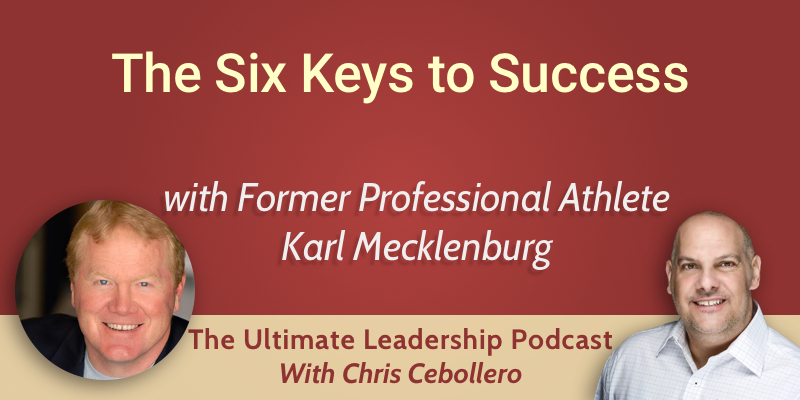 On today’s podcast, we’re joined by former professional athlete Karl Mecklenburg about the six keys to success. When we walk about leadership, the challenges everyone faces are universal. Karl has spoken to many organizations, and he sees similar challenges in all of them. His six keys to success are teamwork, courage, dedication, desire, honesty and forgiveness, and goal setting. Here he breaks down each key and tells us how to apply it to the challenges you face in your life and business. You have to understand what the team goals are, and what that overriding passion is. These goals have to be clear and consistent, and they have to be a cornerstone of the organization for everyone involved. Those goals need to be understood by everybody and talked about by leadership constantly. Create teamwork by saying the goals are bigger than one person. When someone doesn’t show teamwork and doesn’t buy into the team, it is the main reason for letting them go. If someone is gifted but isn’t involved, they will help in the short-term but will be damaging in the long-term. Enforce what is important. Having the courage to try new things and to be decisive is key. Be prepared, always anticipate what’s coming, and take a step before anyone else does. You have to trust yourself to be decisive and have the courage to try new things and step outside of your comfort zone as it keeps you up with change. Things never go right at first, but you need to have the courage to keep trying. Don’t give up or quit if something is important to you. People fail, that’s what being a human being is, but you have to believe in yourself. Karl says that anywhere he can find a new input to continue his learning, he tries to do it. If you can take one thing away from every piece of learning you try, it’ll make you better and this is vital for keeping up with change. Have extravagant long-term goals for every part of your life, and think about how you can apply those to the challenges you face. Big dreams mean you will run into obstacles, but success is overcoming those. If you know where your desire is, you can start working towards it. Have a boiled down message in ten words or less of where you want to be and what’s important to you. When you have to make a decision, you can refer to your message and make the right choice. Keeping the desire burning is what will get you over the hump when you feel like quitting. As a human being, you will have the tendency to think “that’s not my fault” when something goes wrong. Karl talks about the honesty from the NFL and how it’s missing in the business world. If you can build a culture where people are able to say they were wrong, everything will work better. Forgiveness starts with yourself, as you need to be able to forgive yourself for mistakes before you can forgive someone else. If you’re a leader, you should know the strengths and weaknesses of your team. Don’t put someone in a situation where they’re going to fail. When you have goals set for your business, it will drive your desire and your honesty and forgiveness. Karl says that one person can make a huge difference in a business if they step out of the middle group and become a leader. Give people opportunities, and connect with them to be successful.